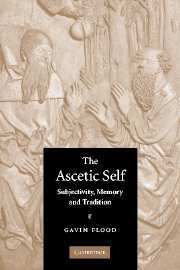 A review of The Ascetic Self: Subjectivity, Memory and Tradition. by Gavin Flood (Cambridge University Press, 2004). What does asceticism have to do with the formation of religious subjectivity? Can asceticism provide a point of comparison between religions? Gavin Flood, in his excellent new volume, The Ascetic Self, answers these questions with the thesis that asceticism is “the internalization of tradition, the shaping of the narrative of a life in accordance with the narrative of tradition that might be seen as the performance of the memory of tradition” (p. ix). Flood treats the literature on asceticism that has accumulated over the past twenty years or so. Key figures of the field are Geoffrey Harpham, Peter Brown, Wimbush and Valantasis. Flood offers his own work as a contribution in the direction of comparative religion. In the introductory chapter Flood defines asceticism. Etymologically, the word stems from the Greek word ascesis, or, “exercise.” In a tips of the hat to the original meaning, asceticism is for Flood, the performance of bodily discipline or denial for the sake of a tradition-specific transcendent goal. Asceticism is the shaping of a life in accordance with a textual and interpretive tradition. Insofar as it is interpreting authoritative texts, asceticism is a “performance of memory;” that is, the embodied acting-out in the lives of believers the remembrance of what the tradition passes on. In the very process of forming the “ascetic self” there is, across traditions, a paradox in the ascetic self between the eradication of the will (or “self-will”) and the affirmation of the will in its transcendence over the body. Space prevents me from discussing the body chapters in detail, but unlike so many recent academic books, Flood consistently argues his thesis throughout the text. Included in the volume is a chapter that introduces the modern reader to the practices of asceticism through a modern ascetic, Simone Weil. The next three chapters discuss eastern ascetic traditions. Chapters two and three discuss yogic and tantric traditions respectively. Of particular interest to Christian theology, the last two body chapters cover Christian asceticism: eastern and western monasticism respectively. Flood argues that there is a link between religious cosmology and textual traditions on the one hand, and textual traditions and traditions of renunciation on the other. Asceticism only makes sense within religions committed to a cosmological tradition. These kinds of cosmological religions claim that by “reversing” the orientation of our desires, we may actually attain a higher good than the merely sensual. Thus, cosmological and ascetical traditions understand their own practices to “open out” to contact with the transcendent realities that the religious tradition is committed to, e.g., “God.” This means that, within each tradition, knowledge of, or contact with, the transcendent realities they believe in is only accessible through the body-shaping asceticism of their respective traditions. Interestingly, Flood claims that Protestantism lacks formal asceticism exactly because it has divorced Christian religion from Christian cosmology. Flood has two major goals for his thesis, represented by two distinct concluding chapters. In the first concluding chapter Flood attempts a new postcritical paradigm for comparative religion. Since he welcomes postcritical developments in the study of religion, he is willing to take seriously the truth claims of the various ascetic traditions about the nature of the self and reality. By discovering structural similarities in the ritual processes that form the “ascetic self” among the various traditions, Flood makes a postcritical-style comparison of the kinds of subjectivity possible within Hindu, Buddhist, and Christian asceticism. The second concluding chapter concerns the legitimacy of the ascetic self in a “late modern” context. Christian theologians may take issue with Flood’s adoption of a Kantian project of rational self-assertion as his criterion of legitimacy. He never claims, however, to be conducting theology; he explicitly recognizes that religious traditions may not be willing to follow his suggestion to respond to modernity by reconciling critical and traditional scriptural interpretation and asserting a postmodern “perspectivism” with regards to religious truth. Flood recognizes that his postcritical willingness to take seriously the claims of ascetic traditions may implicitly involve him in theology. And perhaps saying so actually makes this work explicitly theological. But Flood cleverly excuses himself with a definition of theology that excludes this work: one must engage theology within a given theological tradition. Insofar as his book is a comparative text and not an attempt to develop any given tradition, his work cannot be considered theology proper. Most Christian theologians would agree. Nevertheless, he does pose an important theological question: can one describe ascetic discipline itself as a (divine) gift? Flood’s significant and erudite contribution to the literature on asceticism, including this question, deserves a theological answer. Nathan G. Jennings is Assistant Professor of the J. Milton Richardson Chair in Liturgics and Anglican Studies at the Seminary of the Southwest. Interesting typology. As smonoee who was a cradle Catholic until 12 years ago, when I was received into the Orthodox Church, some points seem perhaps a bit over-generalized or over-simplified. In my own understanding of Orthodoxy, it isn’t that being a monk is the “highest type”, but rather that the practice of monks, due to how they live, holds much spiritual wisdom to help other non-monastic Orthodox to move towards theosis in their own non-monastical lives in the world. This needs to be done in consultation with a spiritual father/confessor, who may or may not be one’s parish priest, in order to avoid prelest and so on as the Philokalia rightly describes. But it isn’t as much of a “narrow type” as is stated here — the “type” will depend on your own personal life circumstances, relationships, personae and so on. The *means*, however — prayer, fasting, asceticism, sacrament, liturgy — are constant and common to all types on the journey to theosis. The main difference in my own experience here with Catholicism is that Catholicism is more diverse in its “means” (at least in its current form), while Orthodoxy is more narrow in that sense — our praxis is more narrow, but our personae and life circumstances are different, so even though we follow the same or similar praxis (or perhaps the same in abbreviated or relaxed form) the result will look very different across the population of observant Orthodox.Also, theosis isn’t really, in my understanding, having one’s hands in heaven and one’s feet on earth. It is rather simply having one’s humanity converted/transformed/transfigured into the deified humanity of Christ, not by means of the “hypostatic union” as was the case in the person of Christ, but rather by means of the infinite grace of the Holy Spirit. It is having our humanity conformed to Christ’s divinized humanity while retaining our own personae, and doing so “in Christ”, and by the power of the Holy Spirit. It isn’t always going to look like St. Seraphim of Sarov, because different individuals are different, but the *means* by which such divinization occurs is the same.Also, Orthodox saints are quite a bit more varied than described here. Yes, there are the great ascetical saints among the desert Fathers and people like St. Mary of Egypt and St. Seraphim of Sarov, but there are also highly revered saints who were very involved in worldly affairs, like St. John of Kronstadt or St. Elizabeth New Martyr, as well as others who had very active lives in the Church itself (like Chrysostom, to take perhaps the most beloved example, but even in more recent times people like St. Raphael of Brookyln, St. Alexis Toth and St. Herman of Alaska come to mind) or who were simply marytred for the faith (like the Russian Royal Martyrs). All of these would have been observing a fairly narrow set of Orthodox praxis (same or similar prayer rules, similar fasting practices, same liturgical and sacramental life, etc. ), but how this worked out in terms of what kind of lives this process of theosis created in these saints was quite diverse, and not really skewed towards the St. Seraphim/St. Mary variety really.